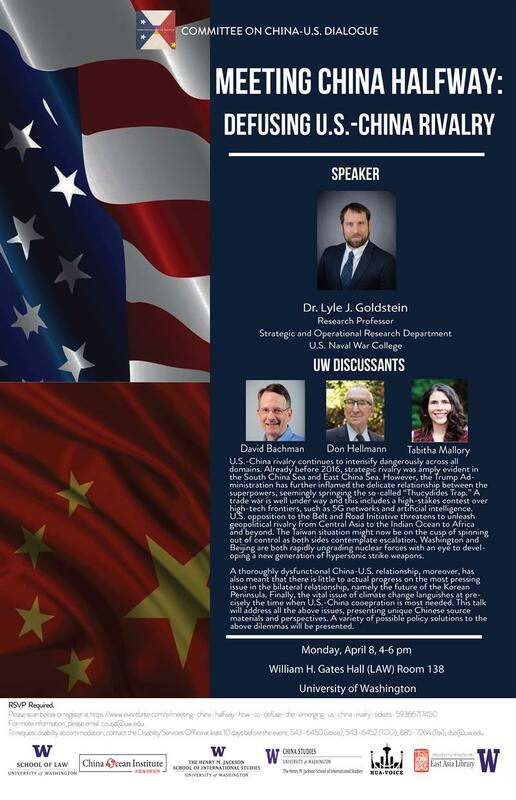 Monday, Apr 8, 2019, 4 – 6 p.m.
US-China rivalry continues to intensify dangerously across all domains. Already before 2016, the strategic rivalry was amply evident in the South China Sea and the East China Sea. However, the Trump Administration has further inflamed the delicate relationship between the superpowers, seemingly springing the so-called "Thucydides Trap." A trade war is well underway and this includes a high-stakes contest over high-tech frontiers, such as 5G networks and artificial intelligence. US opposition to the Belt and Road Initiative (BRI) threatens to unleash geopolitical rivalry from Central Asia to the Indian Ocean to Africa and beyond. The Taiwan situation might now be on the cusp of spinning out of control as both sides contemplate escalation. Washington and Beijing are both rapidly upgrading nuclear forces with an eye to developing a new generation of hypersonic strike weapons. A thoroughly dysfunctional Sino-US relationship, moreover, has also meant that there is little to no actual progress on the most pressing issue in the bilateral relationship, namely the future of the Korean Peninsula. Finally, the vital issue of climate change languishes at precisely the time when US-China cooperation is most needed. This talk will address all the above issues, presenting unique Chinese source materials and perspectives. A variety of possible policy solutions to the above dilemmas will be presented. Professor David Bachman, Professor Don Hellmann, and Prof. Tabitha Mallory from the UW Henry M. Jackson School of International Studies will serve as discussants. Dr. Lyle J. Goldstein is a research professor in the Strategic and Operational Research Department of the U.S. Naval War College in Newport, Rhode Island. He was director of the Naval War College’s China Maritime Studies Institute from 2006-2011, which was established to improve mutual understanding and maritime cooperation with China. Proficient in Chinese and Russian, Professor Goldstein has conducted extensive field research in both China and Russia. His research on Chinese defense policies, especially concerning naval development, has been published in China Quarterly, International Security, Jane's Intelligence Review, Journal of Strategic Studies, and U.S. Naval Institute Proceedings. Professor Goldstein's first book, which compared proliferation crises and focused particularly on Chinese nuclear strategy, was published by Stanford University Press in 2005. He is the co-editor of the United States Naval Institute books China’s New Nuclear Submarine Force (2007), China’s Energy Strategy: The Impact on Beijing’s Maritime Policies (2008) and China Goes to Sea: Maritime Transformation in a Comparative Historical Context (2009). His most recent book, Meeting China Halfway: How to Defuse the Emerging U.S.-China Rivalry (2015), was published by Georgetown University Press. As an important contribution, Meeting China Halfway remains influential and controversial in the field. He earned a Ph.D. from Princeton University in 2001 and has an MA from Johns Hopkins School of Advanced International Studies. Dr. Goldstein has also worked in the Office of the Secretary of Defense. *RSVP is required. Please go to https://www.eventbrite.com/e/meeting-china-halfway-how-to-defuse-the-emerging-us-china-rivalry-tickets-59366717450 for registration. *For more information, please email ccusd@uw.edu.